Elisha Perkins (January 16, 1741 – September 6, 1799) was a United States physician who created his own therapy, Perkins Patent Tractors. It was later subject of the first placebo research. Elisha Perkins was born 1741 in Norwich, Connecticut. He was educated by his father Joseph Perkins in Plainfield, Connecticut, where he later practiced medicine with success. During the late 18th century, the progression of medicine due to the Enlightenment increased the consumer demand for new therapies, such as therapeutic devices and inventions. Consequently, around 1795–96, Perkins invented his "Tractors", for which he took out a 14-year patent on February 19, 1796. The tractors consisted of two 3-inch metal rods with a point at the end. Although they were made of steel and brass, Perkins claimed that they were made of unusual metal alloys. Perkins used his rods to cure inflammation, rheumatism and pain in the head and the face. He applied the points on the aching body part and passed them over the part for about 20 minutes. Perkins claimed they could "draw off the noxious electrical fluid that lay at the root of suffering". The Connecticut Medical Society condemned the tractors as "delusive quackery", and expelled Perkins from membership on the grounds that he was "a patentee and user of nostrums". Perkins nevertheless managed to convince three US medical faculties that his method worked. In Copenhagen, Denmark, twelve surgeons at the royal Frederiks Hospital also began to support the method. Even George Washington bought a set. Other physicians' criticisms were met with charges of elitism and professional arrogance. Perkins boasted of 5,000 cured cases. The cures were certified to by eight professors, forty physicians, and thirty clergymen. Of the purchase made by Washington, Perkins' son, Benjamin Perkins, said that the "President of the United States, convinced of the importance of the discovery from experiments in his own family, availed himself of its advantages by purchasing a set of the Tractors for their use." Benjamin Perkins was a bookseller and introduced the tractors to London. There a Perkinsian Institution for the benefit of the poor was founded under the presidency of Lord Rivers. 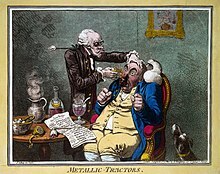 In 1798, Benjamin published The Influence of Metallic Tractors on the Human Body. In October 1799, an advertisement in The Times said that "The tractors, with every necessary direction for using them in Families, may be had for 5 guineas the set, of Mr. Perkins, of Leicester Square; or of Mr. Frederic Smith, Chemist & Druggist, in the Haymarket". I breakfasted with Sir Joseph [Banks] on Monday morning who is recovered from the Gout and in high Spirits. We had a good deal of laughing about the Tractors. Perkins has published several Cases communicated by my Father, and presented me with a copy of his Book. Shortly before his death Elisha Perkins also invented antiseptic medicine and used it for dysentery and sore throat. Perkins also claimed to have discovered a cure for yellow fever. This consisted of vinegar with muriate of soda which he tested in New York City during an outbreak in 1799. The cure had no effect and Perkins contracted the fever and died. After Perkins' death, British physicians began to have doubts about his tractors. In 1799, Dr. John Haygarth conducted a test in which he treated five rheumatic patients with wooden tractors that were made to resemble the metallic ones. Four of them reported that the pain was relieved. The next day the patients were treated with metallic tractors with the same results. Dr. Haygarth reported on his findings in a publication entitled On the Imagination as a Cause & as a Cure of Disorders of the Body. Attempts to use the tractors to cure animals proved futile. By this time, Perkins had numerous influential supporters and the sale of the tractors continued. In 1803, Thomas Green Fessenden published his poem “Terrible Tractoration” in favor of Perkins and as a satire on other physicians. Perkins' son died in 1810. Only after that did the popularity of the tractors begin to wane. In 1932, Morris Fishbein commented that "Unfortunately no one has yet been able to determine whether Elisha Perkins was merely a somewhat deluded physician or actually a great impostor." Perkins was the father of Sarah Bushnell Perkins, who is remembered for her pastels. Robert Medill McBride, Neil Pritchie. (1956). Great Hoaxes of All Time. R. M. McBride Company. William Snow Miller. (1935). Elisha Perkins and His Metallic Tractors. Yale Journal of Biology and Medicine 8: 41-57. Benjamin Douglas Perkins. (1798). The Influence of Metallic Tractors on the Human Body. London: Printed for J. Johnson. ^ Quen, Jacques M. (1963). Elisha Perkins, Physician, Nostrum-Vendor, or Charlatan? Bulletin of the History of Medicine 37: 159-166. ^ Kelly, Howard A.; Burrage, Walter L., eds. (1920). "Perkins, Elisha" . American Medical Biographies . Baltimore: The Norman, Remington Company. ^ Lindemann, Mary (2010). Medicine and Society in Early Modern Europe (2nd ed.). Cambridge: Cambridge University Press. ISBN 9780521732567. ^ a b "Perkins, Elisha". Dictionary of American Biography. New York: Charles Scribner's Sons. 1928–1990. ^ a b Wilson, J. G.; Fiske, J., eds. (1900). "Perkins, Elisha" . Appletons' Cyclopædia of American Biography. New York: D. Appleton. ^ Perkins, Benjamin Douglas. (1798). The Influence of Metallic Tractors on the Human Body. London: Printed for J. Johnson. ^ The Times, October 10, 1799. ^ Clarke, Tom, in La Posta: A Journal of American Postal History, Vol 28, number 2 (whole number 164), May 1997, pp 16-17. West Linn, Oregon: La Posta Publications. ISSN 0885-7385. ^ Profile of Sarah Bushnell Perkins in the Dictionary of Pastellists Before 1800. Image of Perkin's metal "tractors"
This page was last edited on 12 January 2019, at 01:30 (UTC).